History of Ancient China becomes more clear with the emergence of the Shang Dynasty. According to the Chinese traditional sources Shang Dynasty was the second Chinese ruling dynasty founded by Tang who overthrown Jie, the last ruler of the Xia Dynasty about 1600 BC and established himself as king. In contrary to the legendary Xia Dynasty there are firm archaeological evidence which mostly confirm the list of Shang kings from the Records of the Grand Historian written by Sima Qian. The most important source of the period of Shang Dynasty are the oracle bones, pieces of bone or turtle shells which were discovered at the beginning of the 20th century. 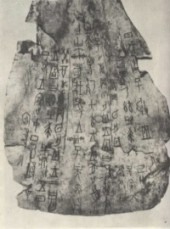 Oracle bones were used in divination and feature inscriptions of the Shang kings dating from the 14th to the 11th centuries BC. The inscriptions on the bone oracles contain important informations about religion in the period of the Shang Dynasty as well as about the form of government, culture, economy, astronomy and medicine. There are other archaeological evidence which provide direct informations about the period of the Shang Dynasty as well but the texts from the oracle bones are crucial for the early history of ancient China. The kings of Shang Dynasty who ruled over much of northern China strengthen their authority and power through frequent wars with neighboring peoples. The society in the Shang Dynasty period was greatly stratified. The king was on the top of the social hierarchy and was the highest secular and religious authority. The right to rule was hereditary but it was not transferred from father to son but from brother to brother. A king’s son could ascend to the throne only when the last of his father’s brothers had died. Established class of nobles was obliged to provide military assistance as an elite forces, while the masses of town dwellings and rural commoners were mobilized when necessary as well. The majority of population was engaged in agriculture and animal husbandry, while the city population especially in the Shang capital city which was moved six times (according to Sima Qian) mostly consisted of artisans and craftsmen. The Shang period is notable for outstanding bronze-works and advanced jade carvings although economy based on agriculture and silk production. Invention of writing is one of the greatest achievements of the Shang Dynasty. The earliest known Chinese characters date to the Shang period although the oracle bone script probably developed through a much longer period of time. The Shang Dynsty probably reached its zenith during the reign Pangeng (c. 1401-1371 BC) who moved his capital to south from Yellow River and renamed it Yin. From henceforth the Shang Dynasty was also referred as the Yin Dynasty. The last Shang king was Di Xin also known as Shang Zhou and as one of the most immoral and cruel rulers in history of China. Di Xin was faced with numerous rebellions during the last years of his rule and had to intervene an uprising in eastern China personally. His absence was taken advantage by the Zhou who attacked and devastated the capital city. The last Shang king was decisively defeated in the Battle of Muye in 1046 BC and committed a suicide.